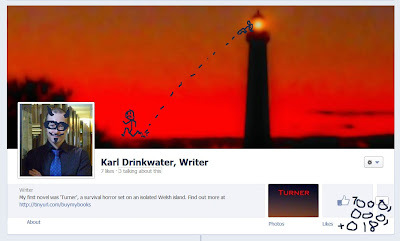 I have a public Facebook page where I post links to do with writing (my own, or that of other people, or writing in general). Facebook is this fancy technology called 'social networking' which apparently enables easy two-way communication. Most reports by people called 'scientists' suggest that by 2015 it will completely replace any face-to-face interaction between humans. The positive effects of this will include eradicating communicable diseases, leading to healthier home sapiens; also it will do wonders for preventing procreation and therefore halting the population explosion. See, come here and you learn stuff! I cannot access "insights about my activity" (whatever that is). I do not count as a whole person. In fact, it makes me look like a pathetic failure of a human being who no-one likes. I will stop eating custard. As you can see, this is pretty serious. So if you use this new-fangled book of faces, please consider clicking the button that says 'like'. I would 'like' you but I'm not on Facebook.